Update Oct 12, 10PM: A number of readers reported they have experienced issues with a previous bonus points promo of MeliaRewards. See the ‘Attention’ section for more details. Sometimes, it might make sense to buy miles. Lufthansa Miles & More sells miles at 0,024€ a piece, which is way too expensive. They also have a buying limit of 12,000 miles per year. However, now and then, there are some great deals to buy miles. MeliaRewards, the loyalty program of a Spanish hotel chain Melia, currently sells its points with a 30% bonus. You can buy up to 100,000 points (with 30K bonus) per account per year. The amazing deal: You can transfer these points at a 2:1 conversion rate to Lufthansa Miles & More. So you’re basically buying miles at 0,0123€ a piece. e.g. You bought 100,000 MeliaRewards points (+30,000 bonus points) for 800€ and converted them to 65,000 miles. 800€ / 65,000 miles = 0,0123€ per mile! 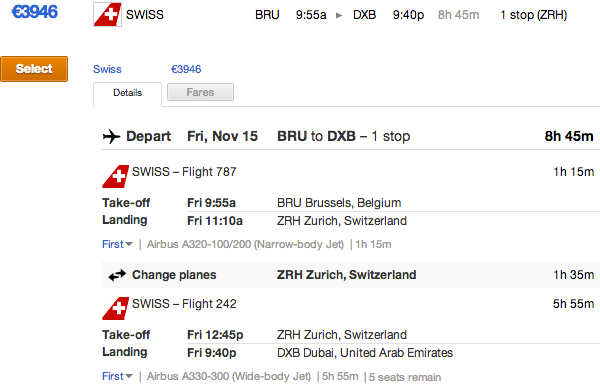 Example: A one-way Swiss First Class flight from Brussels to Dubai (via Zurich) requires 62000 miles + 261€ in taxes & fees. You could buy 96,000 MeliaRewards points (+ 28,800 bonus) for 768€ and convert them to 62,000 M&M miles. 768€ (miles) + 261€ (taxes and fees) = 1029€. A revenue ticket for the same flight would have been 3946€. Pic: Cash booking for the same Swiss First Class flight to Dubai €3946! Some people have reported there’s a maximum of 100,000 points to miles transfer limit per year per MeliaRewards account. However, the first transaction of e.g. 130,000 points to miles went through. Make sure to transfer all your points to miles at once. When you open a MeliaRewards account, you’ll receive 2000 bonus points. DO NOT convert these points to miles as MeliaRewards T&C forbids this. Doing so might result in a complete reversion of all your points to miles conversions. There have been some serious issues with transfers from MeliaRewards to Miles & More earlier this year. You can read about it on Flyertalk and Vielfliegertreff (in German). So if I understand correctly, following the quote above, one has a year time to transfer the miles into the M&M account? Once the miles are on the M&M account, the general conditions of expiry apply, so that the miles are valid for 3 more years? Paul, I do not recommend to buy these points speculatively. The exchange ratio might change, right now it’s 2:1, but maybe in a few weeks/months it becomes 3:1. Same applies for converting them to miles. There might be a devaluation of the Lufthansa Miles & More award chart, which would mean you would need more miles to book an award ticket. Only buy miles/points when you have an immediate use for them. Thanks. Allright Bart, many thanks for the advise and the nice blog! Edit: Katrien, double checked, I don’t see the additional benefit of gifting points. The price is the same and so is the bonus. This is NOT transferring points from your account to another account with 30% bonus, it’s just buying points with 30% bonus for another MeliaRewards member. Greg, you mean 50000 miles for ~420€. It’s a great deal, but unfortunately US Airways does not allow you to redeem miles for Lufthansa or Swiss First Class. Now I’m a complete newb at this whole flight miles thing and like you I’m from Belgium so great creditcard offers for earning miles are rare. Since I know it’s going to take years to gather a decent amount of miles I thought of getting the miles the way you suggest now. My only question is, I’m hoping to gather enough points for 2 return tickets to USA in Business class. Buying these points I still won’t have enough. But if I understand correctly and book 1 business ticket to for instance India with the Miles rewards I’ll spend 62000 miles but earn 106.000. ( checked @ http://www.miles-and-more.com/mediapool/pdf/20/media_785183620.pdf ) Or did I get that wrong? Are you certain the purchased miles can be transferred out to M+M?? I know that there has been some discussion about this aspect of the program in the past. Meliá Hotels International reserves the right to offer different expiry conditions for points awarded in promotions. If a cardholder is awarded promotion points and then decides to leave the programme, these points may not be transferred to another MeliáRewards card or exchanged for points/ miles of cards or companies associated with the programme. It is also strictly prohibited to transfer points obtained from a promotion and not coming from a booking to any other programme or companies associated to the programme, including welcome points, bonus points for registering online, points plus euros, member get member bonuses or any other promotion that may come into effect in the future. As a frequent flyer, can you say in general – just how much availability is there to Lufthansa tickets bought with points? All classes of travel, I mean. And what did you mean about the 1:1 ratio to M&M points? Did you mean that each Meleia points transfers to 1 M&M point? Hi Ben, I would suggest to create a M&M account. You can check availability for Lufthansa Group flights online, even without miles in your account. The 1:1 was a typo in the previous comment, I correct it. Thanks. what do you think about the new terms and condition section tho? and how do you not transfer the 2000 bonus miles? By leaving at least 2000 points in your account. I’m currently monitoring Flyertalk and other forums to get feedback from people who bought MeliaRewards points and requested the transfer to Miles & More. Apperently Melia changed the programm for transferring to M&M miles. Hey Bart, re-reading this old post. I was wondering what is, in 2015, the cheapest way to buy/earn Miles-And-More miles. I’m transferring points from my AmEx account, but I’m missing 11k miles for my dream trip. – sign up for a Brussels Airlines AmEx, to get a sign up bonus (but how long would that take?) and a bonus if is spend enough during the year. That probably will take too long as I hoped to redeem my award in September/October. – buy SPG points, at the rate of 0.035 US$ per mile (with an extra bonus of 5000 miles per 20000 miles transferred). This would work, but is on the expensive side, I guess. Thanks a lot, I had not seen that getAbstract offer, and that is just what I need, at a cost of 0.019 per mile! I don’t think you can apply for the Proximus MasterCard right now. Beobank removed the card from its website. Seb is looking for a source which provides 11K miles rather fast. Indeed, and I recently checked : I have Proximus points from my phone bills, and even though they are still listed as Miles-And-More partners, they seem to have removed the Miles-And-More redemption option. I called to transfer points anyways, and said that it was not available right now. Correct. Seb, I suggest you look for a friend with such account of open one yourself. I can confirm this transfer still works.